Update: The belt-fed machine guns in the above image are in fact Czech Uk vz. 68 (7.62 x 51 mm) models, a type notable for its use in the region. 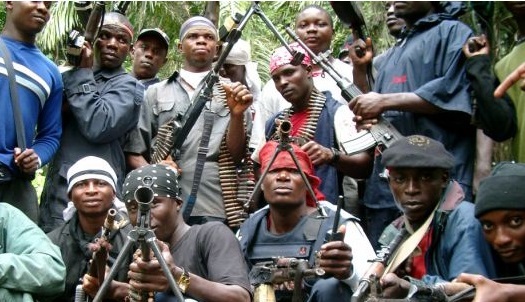 A Nigerian newspaper website last week posted an article examining the ‘Niger Delta Avengers’ (NDA) a non-state armed group formed in early 2016 whose stated aims include the establishment of an independent state in the Niger Delta region. The NDA have been very active since their formation, striking a number of blows against oil distribution infrastructure, including wells and pipelines. 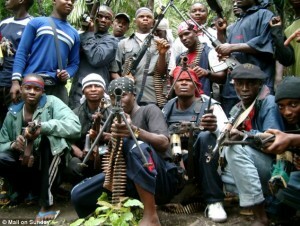 A photograph (credited to the British Mail on Sunday) included with the article shows a group of militants displaying weapons in a show of force. Most are armed with Soviet-era Russian small arms common to the region, including AKM pattern self-loading rifles and Uk vz. 59 or vz. 68 machine guns (many Czech weapons in the region arrived as a result of Czechoslovakia’s support for the short-lived Republic of Biafra; see this ZB 53 GPMG). However, one man on the right of the image is seen holding the more unusual South Korean Daewoo K2 self-loading rifle. This distinctive yet familiar-looking weapon borrows heavily from the design of the AR15. Its receiver (especially the lower receiver) and rotating bolt are Stoner/Armalite designs and, like the AR15, it too is chambered for the 5.56 x 45 mm cartridge. This is one of several rifle calibres in service with the Nigerian armed forces. However, the two rifles feature only a small number of interchangeable components (primarily in the trigger group), and the Daewoo differs substantially from its predecessor, notably with its long-stroke gas piston (integral to the bolt carrier as in the AK design) and internal recoil spring in place of the pseudo-direct impingement and stock buffer tube system of the AR15. The Daewoo K2 features a side-folding solid polymer buttstock and feeds from M16-type STANAG magazines. The appearance of this rifle is not as surprising as it may seem. Between 1983 and 2006, the the Nigerian government purchased more than 33,000 of these rifles. It is not clear how this particular militiaman has obtained his rifle, but it is likely to have been acquired from government ownership via battlefield capture, defection, theft, or corruption. K2 image: Wikimedia Commons. Special thanks to Conway Waddington of African Defence Review.